I have a great friend in San Diego who's been working closely with San Diego Chargers linebacker Shaun Phillips in support of Arnold Schwarzenegger's After-School All-Stars (ASAS). I saw a message she posted about an upcoming event, that I need to share with you. I remember what it was like to wait for my mom or dad to pick me up after school. These days it's basically a norm to have both parents working. After school activities are beneficial in so many ways. Learning doesn't stop when the school day ends. Children need after school activities that are positive and promote maturity. Parents need to find after school activities that enrich their children's lives (e.g. giving back to the community, exercise, and/or learning, etc.). After-School All-Stars is a program that is near and dear to my heart for so many reasons! For those of you that enjoy baseball, why not go to beautiful Petco Park and see the San Diego Padres play the Los Angeles Dodgers on Wednesday, July 28 at 7:05PM? 50% from every ticket purchased with the ASAS promotion code goes to the organization. 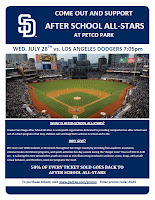 Go to the link and purchase your tickets here, on the Padres promo ticketing site. For those of you out there with deeper pockets, there are also sponsorship opportunities, and 50% of all proceeds go directly to After-School All-Stars. 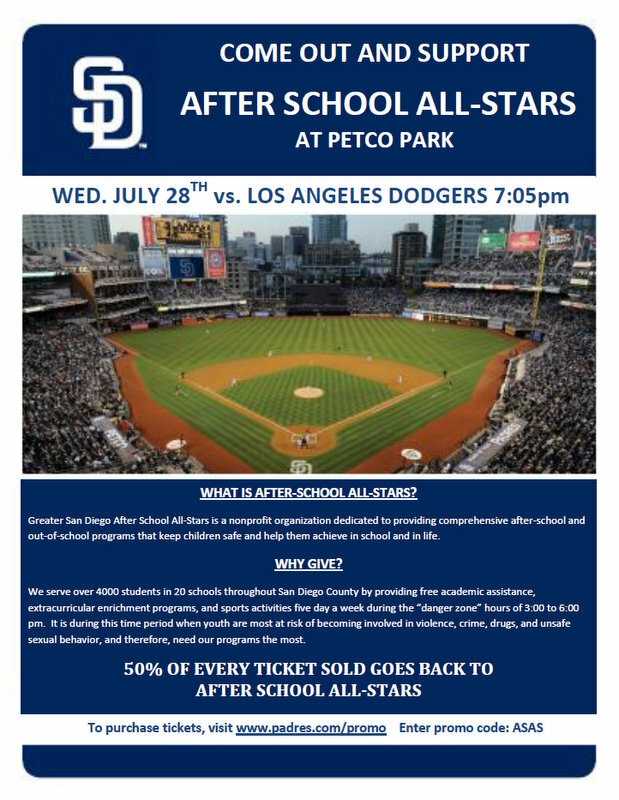 If you're interested in purchasing a package contact Ryan Eifler at (619) 795-5162 or reifler@padres.com. **** Additional information about Arnold Schwarzenegger's After-School All-Stars and Shaun Phillips is at the end of this post. I didn't want the event to get lost in a lot of text, but I want you to have the information. After-School All-Stars(ASAS), but was founded by Governor Schwarzenegger in 1992, who still serves as the honorary chair. We currently have programs in 13 cities across the country serving 80,000 kids daily, including 16 schools in south bay San Diego. Providing academic, enrichment, and sports-based programming for San Diego’s under-privileged youth, ASAS is creating memories and opportunities that at one time seemed out of reach for their young participants. They reach the children who need the programs most, serving over 3,700 children annually in San Diego, 80 percent of whom qualify for the federal free and reduced price lunch program. 78 percent of our participants identify as Latino/a, -- the population that experiences the region’s highest rates of poverty, attrition from high school, and instances of obesity. In the last six NFL seasons, linebacker Shaun Phillips has established himself as one of those confident yet understated work horses. He does his job effortlessly, while opponents study him nervously across the line of scrimmage. He seamlessly stepped into his role with the San Diego Chargers and made an immediate impact with 11.5 sacks, the second most by any lineman in the league. No doubt, this “secret” NFL talent is becoming a household name and in 2009 he was able to prove that with 59 tackles and 7 sacks. Phillips was selected by San Diego in the fourth round of the 2004 NFL Draft and described as a “steal” by the Chargers front office. He finished his collegiate career as Purdue’s all-time leader in sacks with 33.5, and was named a second-team All- American his senior year. He has unquestionably exceeded the expectations that usually accompany a fourth-round draft pick. Phillips is a stellar pass rusher with explosive reaction and an incredible knack for harassing the quarterback. But he is not content to leave his accomplishments where they stand, and he continually strives to improve himself both on and off the field. He enjoys directly communicating with fans in social networks and has an active presence on Twitter with more than 359,000 dedicated followers.